Tungsten Carbide is the choice to provide the best protection available for extreme wear and impact. It and Alpha silicon carbide offer the best wear performance and corrosion resistance of any available materials. The impact resistant and corrosion resistant properties of tungsten carbide platelets and forms can be improved by selecting from the different grades of the material or by selecting from the various application technologies Reparex offers. Used alone or in combination with other wear resistant materials, tungsten carbide whether in the form of cladding, cast in steel or in the form of a weld overlay simply lasts where others fail. It can offer wear life in excess of 5 times that of alumina ceramic and has ability for continuous operation a temperatures up to 900 degrees F (480 C). It can also be machined to very tight tolerances and to fine surface finishes as needed. It is excellent product for use on fan blades, High Effiecency Fan Wheels pulverizer and roller mill liners, target plates in high wear areas, Sand Mixers Sand Mullers and Sand Plows and in pipes and elbows where extreme abrasion exists. Tungsten Carbide Cladding  is applied in the form of solid carbide platelets either AeroTech Bonded or Brazed onto the desired protection area. Brazing offers the highest performing tungsten carbide cladded wear parts with metallurgical bond strengths in excess of 22,000 psi. Tungsten Carbide Shapes - like ceramics tungsten carbide may also be formed into monolithic shapes for applications such as valve seats, seal rings, nozzles, bushings and other mechanical components. Carbistel  Offering parts formed from casting abrasion resistant steel around tungsten carbide granules forming a carbide steel matrix. Ideal for the highest impact applications where gouging and crushing wear is present. Offering both preformed sizes and in custom cast pieces. TufCote  Is made of cast tungsten carbide granules in a self fluxing nickel matrix that is both abrasion and corrosion resistant. 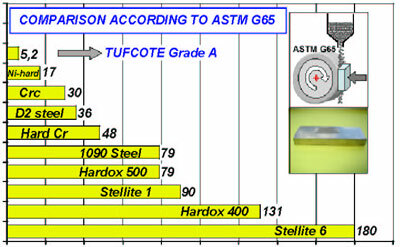 TufCote can be applied in various grade and granule sizes to meet your application needs. It is ideal for shredding, crushing and pulverizing applications where impact and fine particle wear are both present.